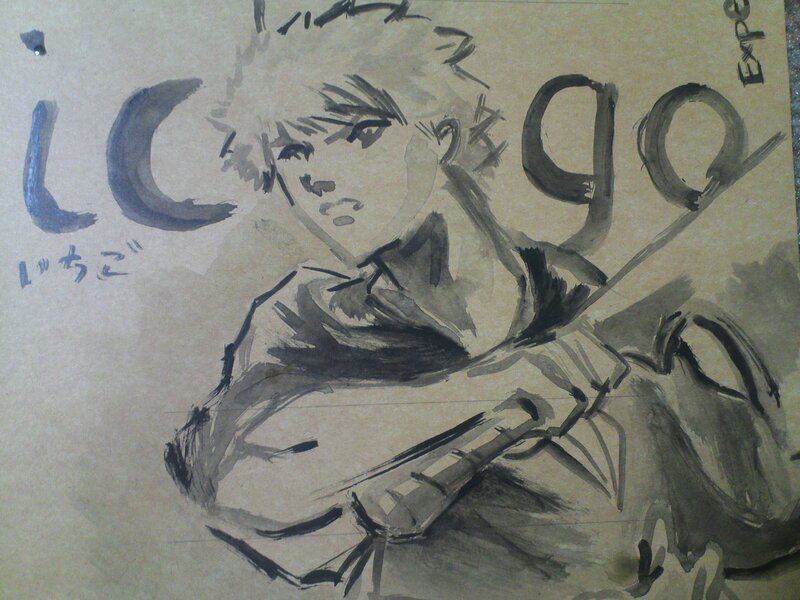 Experimenting with using watered down black acrylic paint for a simple Bleach sketch. I gave it to a 3年生, or third year student (9th grader), at the school I work at, and he freaked out! When I handed it to him, a whole bunch of his classmates surrounded him to look at it. When English class started, the folder got circulated around silently before he placed it on his desk and admired it for most of English class. When class ended, he held up the folder with both hands, went around class trying to figure out if he should post it somewhere, then returned to me and said “Thank you” in Japanese. He went back outside, showed some more students, then came back to me and repeated “Thank you” before showing some more kids. I was really surprised by his reaction, but I was also glad that he liked it so much! This entry was posted in Anime (アニメ), Art (芸術) and tagged acrylic, anime, Art (芸術), Bleach, brush, drawing, experiment, folder, ３年生, manga, paint. Bookmark the permalink. ← There’s Strange Kamaboko in the Window!